What are the unique challenges and opportunities presented by practice at the intersection of law and diplomacy? This key question was the guiding theme of a unique conference on ‘International Legal Diplomacy’, convened by The Hague Institute and the British Embassy in The Hague, which took place on 22 April. 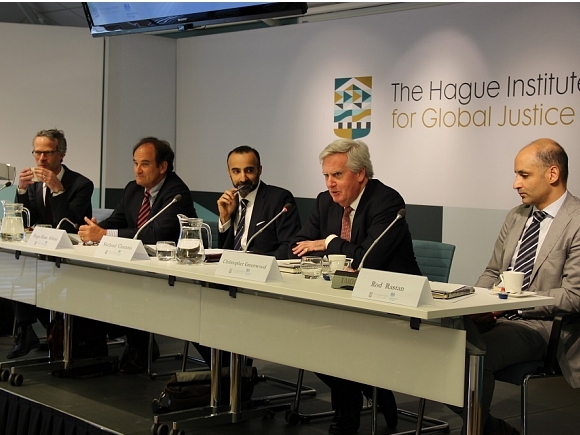 Setting out their vision for a new field of ‘legal diplomacy’, The Hague Institute’s President, Dr. Abi Williams, and the British Ambassador to The Hague, Sir Geoffrey Adams, argued that law was becoming an increasingly important feature of international relations. This raises interesting questions for diplomats and legal professionals alike, and calls for the sharing of knowledge across disciplines, as well as between organizations with similar missions, such as foreign ministries, which are equipped to different extents with legal expertise. Yet while the fields of ‘economic diplomacy’ or ‘consular diplomacy’ are well established, there is no body of scholarship on the practice of ‘legal diplomacy’. Although legal diplomacy is not limited to the interactions between the diplomatic corps and the unique constellation of courts, tribunals and international organizations in The Hague, it is clear that the city, the so-called “international city of peace and justice” is home to a unique number of practitioners dealing with the interaction of law, diplomacy and politics. This was the rationale behind holding the conference in The Hague, which allowed the organizers to convene an impressive group of senior judges, ambassadors, legal advisers, scholars and other professionals. The conference began by soliciting the views of a senior group of practitioners on the concept of ‘legal diplomacy’. President of the ICTY, Judge Ted Meron, considered the diplomatic role of a tribunal president, noting that ‘no job is so uniquely complex, given its intersection of law, diplomacy and politics’. His own role, he stressed, was to ensure the ICTY’s overall mandate was executed. As such, he exercises the functions of a judge, supervises the registry and enforcement of sentences, as well as representing the tribunal externally vis-à-vis victims, states, the media and various bodies within the UN. It was essential, Judge Meron argued, that a tribunal president balance his or her representative role with the need to preserve judicial impartiality. Conversely, states must respect the restrictions intrinsic to the work of courts by honoring and protecting judicial independence, he said. Hans Corell, former UN Under-Secretary-General for Legal Affairs, advanced the view that all diplomats are – in essence – also other professionals; the task for governments was to pick to right one for the job. Therefore, he said, if a diplomatic task requires legal expertise, a diplomat with a legal background should be sent. Taking a wider view, he spoke of his evolving view of the ICC, arguing that the international system simply cannot afford to allow places where criminal law does not apply. The absence of the rule of law, Ambassador Correll said, was the common denominator of conflicts everywhere. H.E. Franz Josef Kremp, the German Ambassador to the Netherlands, focused on the role of legal expertise in the German Foreign Ministry, noting that while diplomats come from different backgrounds, around a quarter are lawyers by training. Learning the lessons of its own history, Germany emphasizes the need to adhere to and advance the international rule of law, which has informed many of the policy positions its government has taken (e.g. over Iraq). Liz Evenson, a Senior Counsel at Human Rights Watch, elucidated the dynamic interaction between law, politics and diplomacy by pointing out that international human rights instruments are legal ones, but must be acted upon by governments making political decisions. Results can be achieved when various actors respect each others’ roles, she said, but she also rejected the idea that there is an intrinsic tension between peace and justice which merits the prioritization of one over the other. The second panel convened four experts with rich knowledge of how legal advice is formulated, provided and acted upon within foreign ministries. Judge Erkki Kourula, a former ICC judge and former legal adviser within the Finnish Foreign Ministry, emphasized the role that information technology can play in balancing law and politics, stressing that such tools should be a core part of the training of future diplomats, as well as opinion leaders. H.E. Maria Theresa Infante, Ambassador of Chile to the Netherlands, shared this view, arguing that academic expertise without practical experience could be unhelpful. Providing examples from Chile’s experience, the role of a legal adviser, she added, was to remain objective, even as political leaders are driven by short-term concerns. 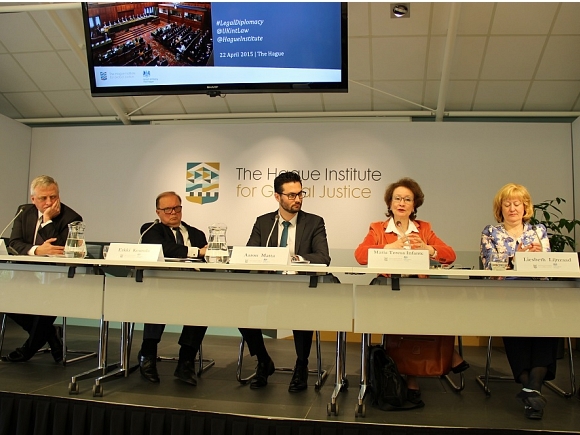 Liesbeth Lijnzaad, Legal Adviser at the Dutch Ministry of Foreign Affairs, queried the extent to which national foreign ministries or the wider international communities engage in strategic planning around international law. In reality, she said, decisions were taken on a more ad hoc basis, and more work was needed to ensure strategic coherence and consistency. For an individual state, this includes questions about the ‘niche’ it seeks to fill, which can stem from its expertise as well as its identity and interests. For the Netherlands, the emphasis of the promotion of international law (enshrined in the Dutch Constitution) is a combination of identity (for the ‘grandchildren of Grotius’) as well as interests (the international legal role of The Hague). Iain McLeod, Legal Adviser at the UK Foreign and Commonwealth Office, stressed that although law had always been a part of diplomacy, there is ‘more law’ than there was and that, moreover, international legal issues are increasingly no longer the preserve of foreign ministries alone, but necessarily engage various government departments. Law is not only more frequently invoked, Mr. McLeod argued, but also more complicated and contested. Drawing on these insights, he suggested that foreign ministries ought to (i) provide good legal advice, drawing on the right expertise; (ii) train diplomats in the law; (iii) ensure coherence across government and (iv) engage with the outside world to explain what the law is and why that is the case. The third panel focused on the perspective of international courts, investigating the balance to be struck between judicial independence and the need to engage with the ‘political realm’. Judge Sir Christopher Greenwoodidentified three schools of thought on the relationship between law and politics: (i) cynics, who see the ‘advocate’s mantle draped on the shoulder of arbitrary power’; (ii) idealists, who believe that justice should be done ‘though the heavens fall’ and (iii) realists, who – per Morgenthau – believe that states can and should act in their own interests. For Sir Christopher, each school advances a misleading conflict between law and politics. Indeed, he asserted, there seems to have been an exaggeration of this tension in a way that simply does not happen in private law. Sir Christopher thought it useful to distinguish between ‘advocacy’ (a lawyer’s legal justification for a client’s position), ‘advice’ (speaking truth to power) and the ‘role of the judge’ (operating per legal principles independently of political considerations). He further advanced four criteria for the effective operation of courts in political environments: (i) isolate issues of legal necessity to create a level playing field; (ii) understand that the possibility of litigation may actually serve the interests of negotiation; (iii) understand that litigation may provide a channel for parties to interact which they otherwise would not have and (iv) encourage judges’ political antennae so that judgements can be crafted in a helpful way without ‘unnecessarily trampling on toes’. In the view of Ambassador Hugo Siblesz, Secretary-General of the Permanent Court of Arbitration, international law is about finding rules-based solutions to issues that would otherwise escalate. The invocation of law can in fact help to depoliticize issues, helping them to be solved. The PCA was created to deal with international differences that could not be settled by diplomacy. It operates on the basis of party autonomy over the nature of arbitration and demonstrates how a third party mechanism may sometimes be necessary where parties could otherwise not be seen (domestically or otherwise) to come to terms voluntarily. Rod Rastan, Legal Adviser in the Office of the Prosecutor at the ICC focused on issues of compliance and enforcement which have presented particular challenges, but which also are perhaps emblematic of the leeway that States Parties prefer to preserve. He called for more legal training within the diplomatic community, which has such a crucial role in shaping the ICC’s budget and rules, as well as shaping the political architecture which – through the role of the UNSC – affects its scope of action. Anthony Dworkin, a scholar at the European Council on Foreign Relations, expanded on this theme, arguing for more coherence in states’ policies on international judicial questions. He queried whether the safety valves which states have built into the international system of accountability are effective in the long run, stressing that a lack of consistency and the possibility of impunity would only weaken the normative deterrence function of the Court in a wider sense. (4) Is Good Legal Diplomacy Good Public Diplomacy? The conference’s final panel considered the links between legal diplomacy and public diplomacy. Anthony Lodge, Head of the Registry at the Special Tribunal for Lebanon (STL), Beirut, suggested that the test for any international institution should be ‘if we didn’t have it, should we invent it?’. Too few international legal institutions were passing this test he said; their leaders must do more to be effective and to explain their work. They must also understand that law is driven by a legal process, but diplomacy is driven by results. In the case of the STL, operating in a highly charged political environment, it was especially important, Dr. Lodge argued, to be apolitical and to be seen to be so. Georgia Tortora, an External Relations Officer at the Mechanism for International Criminal Tribunals (MICT), noted that states’ attitudes to budget issues were driven by their overall perceptions of the effectiveness of judicial institutions. Trust, she said, has a multiplier effect; diplomats can be harnessed as advocates for courts whose work they value. It was therefore vital that judicial institutions had coherent external relations strategies, Ms. Tortura stressed, even though their different organs would naturally have differing priorities. They should also learn from, and act upon, the feedback from the diplomatic community about the information it receives. Matias Hellman, an External Relations Adviser at the ICC, agreed with the critical emphasis on trust. If states trust the ICC’s ability and willingness to deliver, he said, they are more likely to rally behind the court. The dynamic between diplomacy and the law was interactive he said: ultimately, though they must act independently, courts need states to protect this independence. In the case of the ICC, it is clear that the court is independent, but also that it is dependent on the cooperation, support and resources of its States Parties and the wider “global community”. Offering the perspective of the Organisation for the Prohibition of Chemical Weapons (OPCW), where he serves as a legal adviser, Olufemi Elias, said that he preferred to think of legal diplomacy as ‘diplomacy using the law’. International law, he continued, always has objectives; its role is to guide decision-makers in making sound legal decisions. In his view, public diplomacy could not necessarily be detached from diplomacy writ-large, but he added that the current OPCW public diplomacy strategy has little to do with law. Summing up the day’s discussions, Abi Williams focused on (i) definitions; (ii) principles of legal diplomacy; (iii) policy and practice; (iv) personnel and (v) tools. In terms of policy and practice, Dr. Williams reflected that the conference has elucidated the tensions between law and diplomacy; the ways in which international law can be harnessed as a state interest; the domestic influences on the practice of legal diplomacy, including the role of different government departments; the possibility of sharing best practices and the role of lawyers in policy formulation (they should, both Dr. Williams and Ambassador Adams agreed, be included early, not just when things go wrong). Training for personnel – both lawyers and diplomats – was essential, Dr. Williams added, as was the need to strike a balance between generalists and specialization. Both lawyers and diplomats must engage with the outside world, he continued. Finally, they must make good use of the tools at their disposal, including by exploiting information technology and by cultivating a better understanding of the strengths and weaknesses of the various policy tools in international law, such as sanctions. Concluding the conference, Ambassador Adams underlined his desire to continue discussions with conference participants and the broader legal and diplomatic community about the ways in which the insights provided by the conference could be harnessed. The Hague Institute and the Foreign and Commonwealth Office intend to continue their work in this regard, and look forward to a wider debate with interested scholars, diplomats and legal professionals. A full conference program, as well as event audio, is available here. 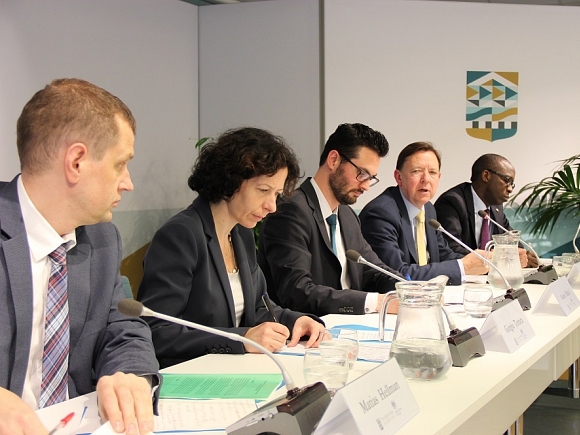 More information on the conference can be obtained by writing to Mark Bailey (M.Bailey@TheHagueInstitute.org). The organizers plan to publish full conference proceedings in due course.